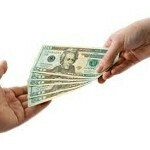 A report from India says that Finnish handset manufacturer Nokia is starting a new campaign to push sales of the Nokia Lumia 710 and the Nokia Lumia 800 in the country. 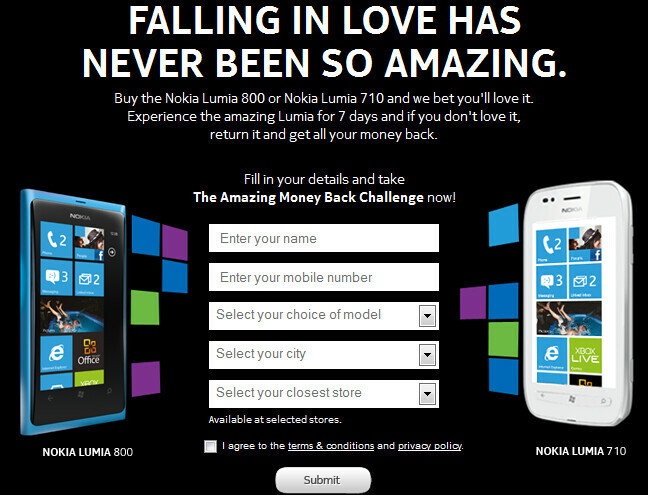 Called the 'Amazing Money Back Challenge', it allows those purchasing the low to mid-range Nokia Lumia 710 or the mid to high-end Nokia Lumia 800, to return the device within 7 days for a full refund. For those in India to take advantage of the promotion, they need to go to Nokia's Facebook site to fill out a form that asks which of the two models the potential buyer wants along with the name of the city he/she lives in. The closest store to that city will respond. Or, you can just saunter into any participating retailer and get hooked up. To return the phone, it must come back to the same store it was purchased from in almost perfect condition with the original packaging, manuals and accessories. Nokia and Microsoft have had a number of interesting challenges including #SmokedByWindowsPhone. Who could forget the girlfriend who berated her steady for losing Nokia's "Blown Away By Lumia" challenge in India earlier this year? This particular challenge is probably an attempt by Nokia to clear the decks before the new Windows Phone 8 models start coming in. Remember, existing devices will not be getting updated. Its available online.like on ebay.... But remember you'll not get any support or warranty in india..
hanging around with a lumia 800 is so much sweeter than with the iphone. They're just tryna look good in their most loyal country,in developed countries its mandate for companies to give cooling off period which mean you can buy things and if you returned it within so and so period depending on country and products you get full refund!